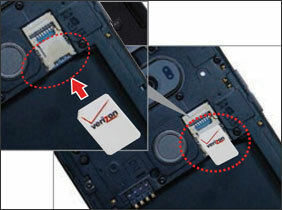 Inserting/removing the SIM card can be helpful when receiving activation errors (SIM not detected / Not valid / failure / not recognized / misaligned) on a 4G device. 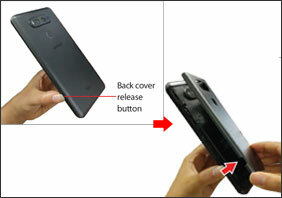 With the display facing away, press the back cover relase button (on the lower-left edge) then lift the cover off. Si es necesario, quita la tarjeta SD. Con los contactos dorados hacia abajo, alinea la tarjeta (la parte de la muesca primero) y luego desliza la tarjeta SIM para meterla. 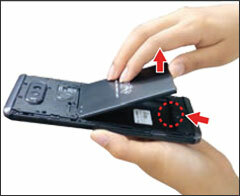 If necessary, with the gold contacts facing down, re-insert the SD card. 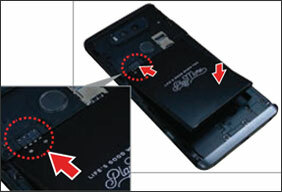 Ensure connectors on the battery align with the connectors on the device. Align the cover and press it into place.